1. I have come to the sad realization that I will never love anything as much as much as Leslie Knope loves Pawnee. Even though the town is plagued by raccoon infestations and its only real claim to fame is being the 4th most obese city in America, Leslie Knope still loves Pawnee, “The Factory Fire Capital of America,” more than I could ever love my family, my fiance, and even my dog (yes, in that particular order). 2. After Tom Haverford’s lesson on food names, I will never refer to foods by their proper monikers again. I will forever eat saneys and now refer to fellow blogger Jennifer as Chicky Chicky Parm Parm, I don’t know where that came from. It doesn’t help that I have spent hours pressing the refresh button on Tom Haverfoods and laughing about deja food. Sidenote: Waitresses look at you funny when you ask for a bottle of kanye blood for your fries. 3. Uber BFF Ann Perkins has given me unfair expectations of what it means to be girlfriends. Why aren’t my friends gluttons for punishment who will listen to me blather on psychotically and take part in my irrational hair brained schemes lucy and ethel style? 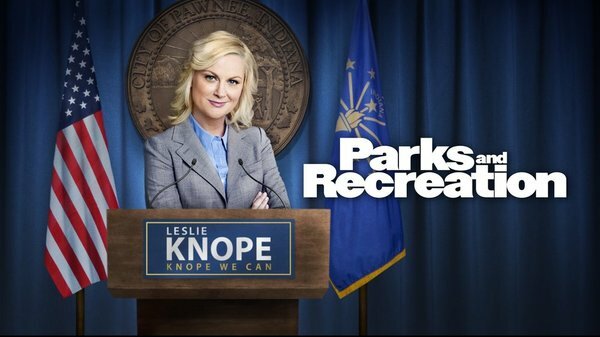 Ok, maybe they do that a little, but no one takes one for the team like Ann Perkins who goes so far as to let Leslie pimp her out in an attempt to get funds for the Parks Department. That is some serious commitment. I literally have besty envy. 4. While we are on the subject of unfair expectations, ccan I just say Ben Wyatt has given me second thoughts about my Jake Gylenhaal soulmate status. Besides the fact that I laugh like a school girl at his adorkableness every time he gives one of his deadpan looks into the camera, he’s willing to sacrifice everything for Leslie which is super duper true love-ish, and did I mention he is incredibly adorkable? Oh, I did? Well then continue on before I come up with some kind of inappropriate comment about him being welcome to my calzones. 5. I will never have a job as great as working for the Pawnee Parks Department (no, not even writing on this blog compares. i know you’re shocked, but hear me out). Leslie has the best boss on earth in Ron Swanson, the most amusing co-workers, the total and undying support of everyone around here to do whatever she sets her mind to, oh and there’s also this guy Jerry or Gary, but whatever.